The 9770R-12 provides +/- 12VDC @ 300mA regulated, dual-polarity supplies. There are connection areas for up to 6 devices. LEDs indicate status of AC input and both power rails. 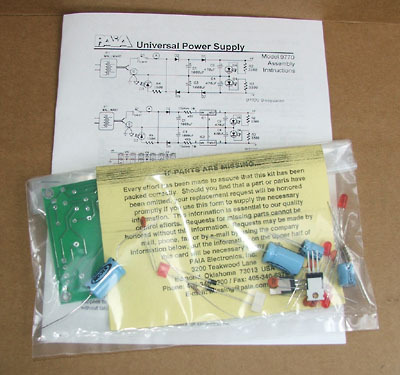 Kits include tin-lead plated and solder masked circuit board (4" X 2-3/4"), wall mount transformer and all electronic components.